In most cases, a patient’s implant-restored smile comes from several places. One company may manufacture the implants and abutments, while a separate dental lab may be responsible for creating the final restoration. Hybridge dental implants in Jacksonville help to streamline the process, thus providing more reliable results and gorgeous smiles that have the potential to last a lifetime. Hybridge is a company that is at the forefront of implant dentistry. They manufacture high-quality, biocompatible dental implants. They also create full-arch restorations that are specially made for the Hybridge implants. 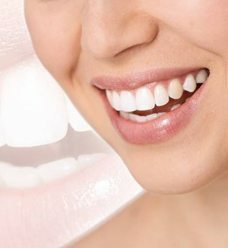 They work closely with dentists to ensure that patients can enjoy beautiful and functional results. Perhaps the most outstanding thing about Hybridge is the strict standards that they hold dentists to. Any doctor who is Hybridge-certified must follow the company’s protocol for placing and restoring the implants. Their insistence on clinical excellence helps to reassure patients that they have the greatest chance possible of making it through the implant process without complications. 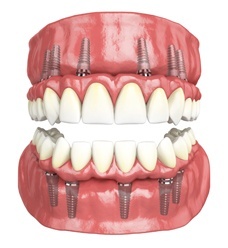 The Hybridge process is similar to a traditional implant procedure. First, we carefully plan out the placement surgery. Then, our team gently inserts the implants at precise locations throughout the jawbone. Following a healing period of a several weeks to a few months, you can receive your permanent restoration. The laboratory that creates Hybridge restorations uses only the latest in dental technology. The highly trained technicians their use data from your local dentist to create a new set of teeth out of materials that are approved by the American Dental Association. Every step of the way, they take measures to ensure that the prosthesis they produce provides superior functionality, durability, and aesthetic beauty. Am I a Candidate for Hybridge Dental Implants? Hybridge’s main focus is on full-arch restoration. Therefore, if you have suffered significant tooth loss, or you anticipate that a great number of your teeth may soon need to be extracted, you may be able to benefit from Hybridge dental implants. You have adequate bone density in your jaw to support dental implants. You want to experience tooth replacement that is far superior to traditional dentures. You understand that the overall process may take several months. If you think Hybridge implants might be right for you, we invite you to schedule a consultation in our office. We are the only Hybridge-certified practice in the area, and we’ll be happy to help you determine whether this remarkable procedure could rebuild your lost smile. What Is the Cost of Hybridge? The cost of the Hybridge procedure varies from patient to patient. The final price of your new smile will depend on how much preliminary work you need, whether you have any natural teeth remaining, and other factors. When you visit us for a consultation, we will give you a personalized estimate of your treatment cost. The special process that the Hybridge laboratory uses to create their full-arch restorations may make your new teeth more affordable than a traditional implant-supported denture. However, you can still expect to pay thousands of dollars for your treatment. Our team will help you explore payment and financing options so you can get the gorgeous new smile you deserve without sweating too much about your budget.